"Join dock sections or a fixed ramp to the dock at varying angles. Kit includes 2 hinge sets and 4 backer plates. 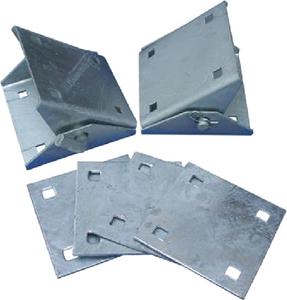 11 Gauge 1/8"" (nominal) hot dipped galvanized steel with 7/16"" holes for 3/8"" Carriage Bolts. Requires 16 x 2-1/2"" x 3/8"" carriage bolts, lock washer and nuts (not included)."